Good Morning my friends!It is a great day today, since I am honored to have in my blog an amazing tutorial of a sweet lady and great crafter, Angela by AngelasSweetGarden. 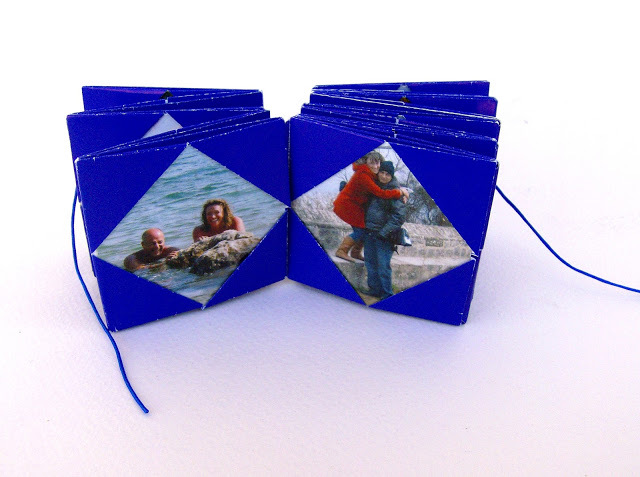 A beautiful pocket photo album, full of memories for you or your friend, a sweet and uncommon gift for Valentine’s day. Hope you will enjoy it….. There is no better feeling than making by yourself a present for your other half! For this year’s Valentine’s Day, I’ ve decided to make a pocket photo album for my boyfriend, so that he can carry me with him all day long (no selfish at all, right?). I will explain the procedure step by step so that you can try it out too! 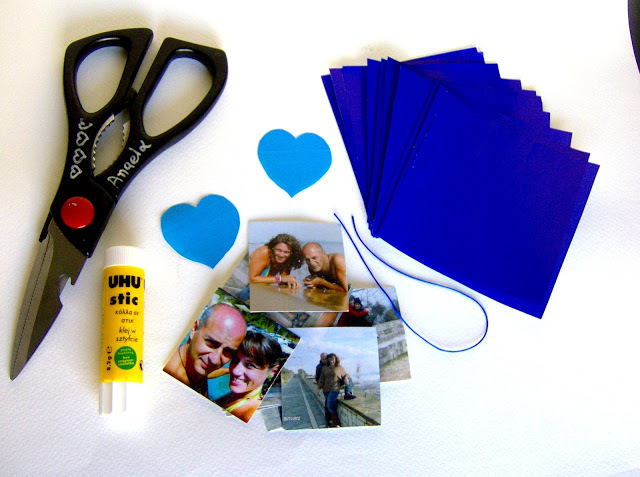 Glossy paper in 2 colors, scissors, glue, thread, photos. I used blue glossy paper, which I cut in pieces of 10×10 cm, light blue glossy paper, from which I cut out 2 hearts about 4×4 cm and photos 5×5 cm. 1. 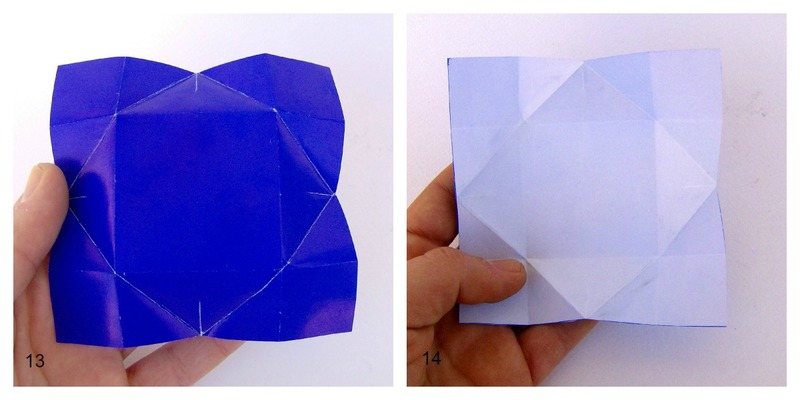 Take one of the square pieces in your hand, fold it in half but not all the way down. Just pinch on the side, so that you can mark the middle. 2. Open it, turn it 90° and repeat the first step. 3. Open it again and the square should look like that. 4. Fold one of the sides in the middle, using the marks you made on steps 1 and 2. In this step and the following, you have to fold all the way down, not just pinch. 5. Now fold in the same way the other side. 6 -7. Open it, turn it 90° and repeat steps 4 and 5. 8. Open it and hold it so that you can see the colored side. 9. Take one of the corners and fold it inwards to the center of the square, using again as guidelines the marks made on steps 1 and 2. 10-12. Repeat it for all the corners. Just make sure they apply exactly, without leaving any spaces. 13. Open the square for one more time. 14. Turn it upside down so than you can see the white side. Notice that in every corner you have created one small square. 15. Fold the bottom corner inwards. Make sure the edge is facing the central fold’s edge point. 16-18. Repeat it for all the corners. 19. Put the square in your palm and push it gently inwards. 20-21. Make the final folding pushing in the blue corners one by one. 22. In the end, your unit should look like this. 23. Take two of them. 24. Unfold one of the corners of the right one. 25. Place it in the right side of the left one. 26. 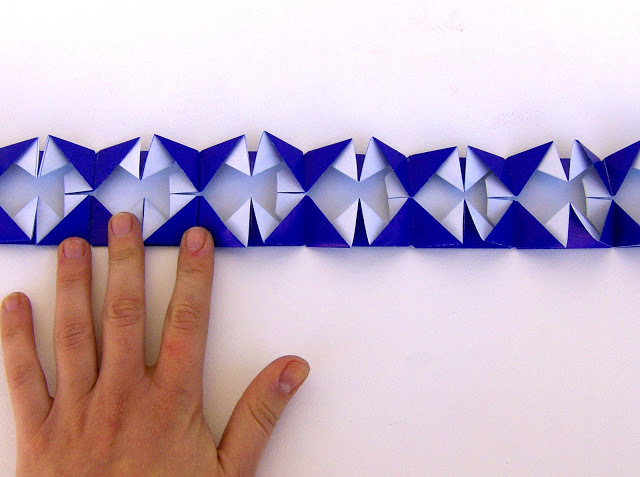 Now that the two corners of the two units are the one inside the other, fold them together inwards. 27. Repeat steps 24-26 to connect all the units. 28. Put on by one the corners of the photo in the corners of every unit. 29. 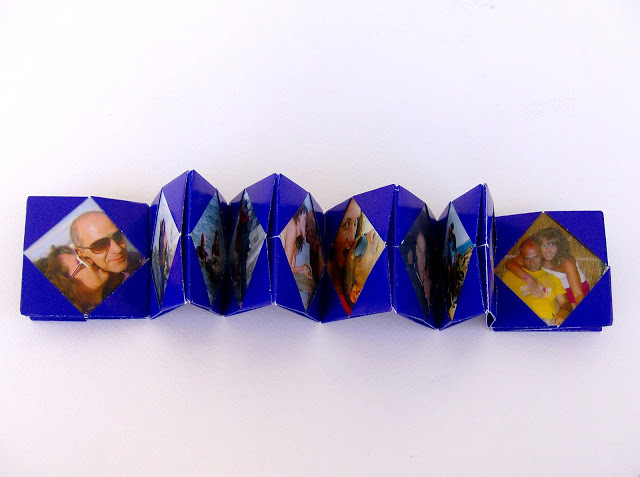 After you have placed all the photos, fold the album. 30. 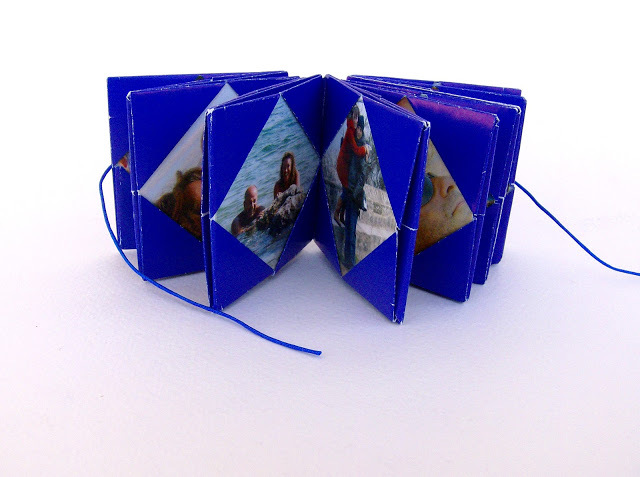 Place the thread around the album, allowing it to exceed evenly on both sides. 31. Glue one of the hearts on the front side. 32. Glue the other heart on the back side. Thank you Angela !!! A really beautiful idea for a handmade gift! Fantastic idea!!!! And great tutorial!! thank you for sharing Angela!!!!! Such a wonderful tutorial, and the photos are great. Thank you! Great job and beautiful blog!